Hostel is located in the most popular building-well of our city. This great building is an architectural monument, which was built in 1880. Seven hundred meters distance is to our central Deribasovskaya Street. The building in which the hostel is located was built in 1880 and is a monument of architecture of the city! Every room has its own air conditioning and ventilation. The beds in our hostel are made of natural wood from the ecologicaly clean region of Ukraine. For our every guest we give two white towels and the key from his own locker. Also every has the place for storing luggage, a lamp and a power socket for charging gadgets near his bed. Hostel was awesome! Really great staff! I arrived early in the morning from the night trainand they let me shower and check in early so I could nap after my journey! It was brilliant! Great hostel, very clean, nice and quiet. Staff is very nice. I would definitely go again ! 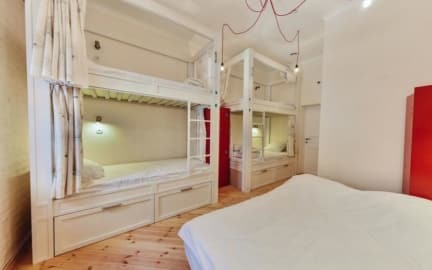 A great hostel in the center of Odessa ! Very clean , stuff is friendly and helpful. The only problem is the lack of space to chill adn socialize. I would reccomend this place for everyone who comes to visit Odessa for a short time ! Very nice! The nicest and cleanest hostel I had stayed so far. Staff was professional and friendly. Excellent location. From the railway station you should travel with bus No. 175 or 121 located across the street opposite to the train station when you leave it, it on the right side. There is a supermarket located closed by. The historical center can easily be reached on food. 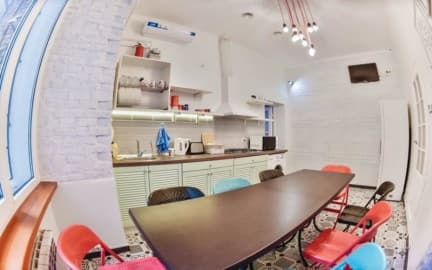 Very good hostel in an excellent location. Generally speaking, everything was kept very clean and tidy. The bed was comfortable and the dorm dark at all times because of very small windows- safe to say it was the best hostel I've stayed in in terms of rest/sleep quality. The atmosphere in the hostel was the only thing that was slightly lacking, largely because there was no big common room/ chill-out space in which to socialise. Not a massive problem as there was a cafe adjacent to the hostel. This place I booked because dream was fully booked for one night. Negatives: Zero atmosphere and the top beds are very high up. Not very social at all. Staff are nice though. And if you just want a place to crash you could do worse. Secure and clean.